Introduction (under construction! ): Sabazios is an ancient Thracian deity, whose precise nature is much debated in academia, with many scholars claiming with certainty an understanding of His place in the Thracian devine mythos. The confusion around this particular deity is not surprising, given the relatively unexamined nature of Thracian culture and religion in general. Since the last decades of the 18th century, when Thrace was first examined from a "modern academic" perspective, Thracians have been denigrated to the ranks (and rancor) of savage drunken barbarian neighbors to the North of the "civilized" Hellenic world. 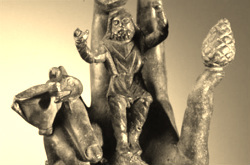 As Dr. Aleksandr Fol, late founder of the Institute of Thracology in Sofia, Bulgaria, points out in numerous academic publications, Thracians have yet to be definitively studied as anything but an "alien culture" through a Greco-Roman perspective. Yet, their influence on the Greek and Roman world was profound, which none can argue, even if what those specific influences were are still hotly debated. Sabazios, whose various syncretisms will be addressed and explored elsewhere, is a god whose name most likely draws from related terms meaning freedom, and fluidity. He is described at one point in modern scholarship as "the most changeable of gods", and again, "as the god of no mythology". I refer to Him as the "Unstoried One", for indeed, the documented stories pertaining to Him directly are few and far between, despite his rampant worship and undeniable -- if at times controversial -- presence throughout the many nations of the ancient world. In short, Sabazios is a Solar-Chthonic nomadic Thracian mountain warrior horseman god of ecstasy, oracle and nocturnal thunderstorms, associated with all manner of mystical, totemic, and esoteric symbols, tools, and practices. Among His most prominent associations is the serpent, a spear or thyrsus-staff and His primary sacrificial animal, which seems to shift geo-culturally between the horned ram and the bull. He is more closely linked to beer than wine, but it seems that any liquid intoxicant would suit Him and His cult just fine. In the ancient world, through interpretatio romana and interpretatio graeca Sabazios was syncretized very heavily with Jupiter/Jove/Iovis, Zeus, and Dionysos-Bacchus. A note on spelling: Sabazios' name is inscribed and rendered by various ancient authors in a number of ways (Sabadios; Sauazios; Saazios; Sabos; Sebazios; Sabadius; Sebadius; Sabasiua; Se'beziu; Sabadiua; Sebadi; Sebadas; Sabazis; Sabasius; Sebesius; Sabadius, etc) and, despite the demonstrated variance of these forms, it is accepted that all of these names refer to a single god. Contemporary spellings -- "Sabazios" and "Sabazius" -- are drawn from the most frequently occurring renderings, which geographically and chronologically support a brief divide in the deity's cultural identity. The first version, "-zios" is commonly used to refer to older, Thracian understandings of the deity, and is likely closer to how His earliest worshippers spoke the name. The second version "-zius" is a later rendering, frequently considered the Roman variation. While both are acceptable and more or less interchangeable, I have a personal preference for the older "-zios" form, and He doesn't seem to mind between them.